From vodka infusions to liqueurs, there are many ways to get the sweet taste of strawberries into your drinks year-round. Come spring, you will notice the produce market explode with the berries and this is the perfect time to play with a few homemade mixers like this strawberry syrup. The recipe is very easy and can be used in a variety of drinks. It was designed with a strawberry gin & tonic in mind. It can be added to the blender while mixing a milkshake or simply used as a base for Champagne, ginger ale, or sparkling cider. It also makes a fantastic strawberry cola. Stepping beyond strawberries, this simple syrup recipe can be adapted to other fruits. The process is the same and once you learn how to make one fruit syrup, the rest is easy. Muddle the strawberries to release the juice. On the stove, bring the sugar and water to a slow boil while stirring constantly until all of the sugar is dissolved. Once boiling, reduce heat and add strawberries and vanilla extract. Cover and simmer for about 5 minutes, stirring occasionally. Remove from heat and allow to cool and infuse for about 2 hours. Strain to remove all of the strawberries and bottle in a well-sealed container. Stored in the refrigerator, it should keep for about two weeks. 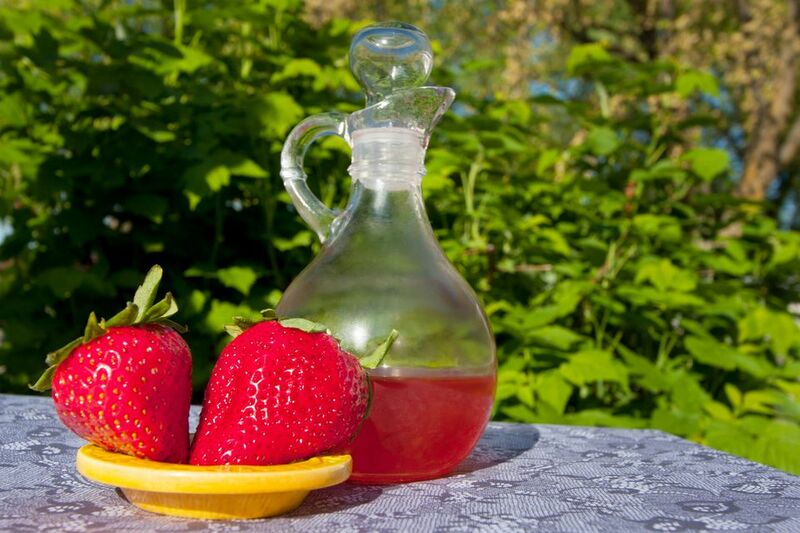 This syrup can be used as a substitute for a strawberry liqueur as well. You can also use it as the flavoring ingredient for making your own liqueur with a vodka base. This process would be similar to making amaretto though you've already done the cooking by making the syrup. The difference with this strawberry syrup and other recipes is that it has a small amount of vanilla extract. The berries alone create a syrup that lacks a bit of richness and the vanilla is the perfect touch to bring it into balance. As you explore more fruit syrups, you may not always need the vanilla extract. Keep it with all berry syrups, but hold it for other fruits. If you do find it lacking a richness at the end of the infusion time, stir in a little vanilla. Almond extract is another option as well. Optionally, you could use a darker sugar, such as demerara or even a 1-to-1 ratio of white and brown sugars. The three large strawberries produce about 3 ounces of juice. It's best to keep the muddled pieces of fruit in the syrup and wait to strain them out once it has cooled because it adds to the flavor. You will need to double strain to remove all of the berries and sometimes it may take two or three times to get a clean syrup. Fruits are the perfect flavor foundation for homemade simple syrups. They are a great use for leftover fruit and are among the most versatile syrups you will find. You can use the strawberry syrup recipe for other juicy fruits like berries, citrus fruits, and peaches. Simply muddle the fruits and add them to the syrup. Even fresh fruits that have less juice can be used because the long infusion time will extract the flavors. They may not muddle as well, but if you cut pieces of apples, mangoes, or pears and allow them to simmer in the syrup, your syrup will have a nice flavor. Don't be afraid to combine fruits or pair fruits with herbs. The flavoring possibilities of simple syrup are endless and they can be used to sweeten some of your favorite cocktails. Let your imagination run wild. You can pair fresh fruits with fruit juices while making syrups as well. Simply replace some of the water in the syrup recipe with the juice of your choice. It's typically best to stick with a 1-to-1 mix of water and juice. For instance, you can make a delicious mixed berry syrup with fresh raspberries and strawberries and use 1/2 cup each cranberry juice and water.